The 2014 edition of downloadable bookprofiles 330 schools in the US and two in Canada that demonstrate exemplary commitments to sustainability in their academics, campus infrastructure, activities, and career preparation. It was developed in partnership with the US Green Building Council's Center for Green Schools. 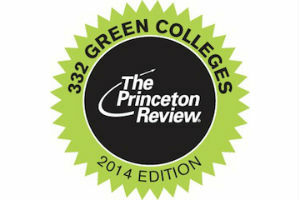 "Pepperdine is thrilled to again receive recognition for our sustainability program in 'The Princeton Review's Guide to Green Colleges,'" says Rhiannon Bailard, founding director of the Center for Sustainability. "We view sustainability as an ethical obligation, which exists in perfect harmony with our values-based mission. We look forward to sharing many of our exciting new initiatives with the Pepperdine community, including our recent prohibition of rodenticides and our pending implementation of a "green" dorm called the Eden Project. Pepperdine was recognized for its myriad sustainability initiatives, including a commitment to using reclaimed wastewater for campus irrigation; its use of renewable sources such as geothermal wind, solar, and biomass, as energy; and the Graziadio School's certificate in Socially, Environmentally, and Ethically Responsible (SEER) Business Strategy, among others. The review highlights Pepperdine's Rideshare and subsidized public transportation programs, as well as its fleet of twenty electric vehicles. It also references undergraduate research opportunities in areas such as stream habitat restoration, post-fire ecology restoration, and coastal habitat monitoring. Generously mentioned is Pepperdine's organic community garden, which provides a platform for teaching organic gardening methods and allows students, faculty, and staff to grow their own organic plants. The review also mentions Pepperdine as the site where Governor Arnold Schwarzenegger signed the historic Global Warming Solutions Act, which seeks to bring California's greenhouse gas emissions down to 1990 levels by 2020. The Princeton Review chose the schools for this guide based on a survey it conducted in 2013 of administrators at hundreds of four-year colleges to measure the schools' commitment to the environment and to sustainability. The institutional survey included questions on the schools' course offerings, campus infrastructure, activities and career preparation. The free, 216-page book can be downloaded at http://www.princetonreview.com/green-guide.aspx and http://www.centerforgreenschools.org/greenguide.